aFrom the Department of Radiology, The First Affiliated Hospital with Nanjing Medical University, Nanjing, Jiangsu Province, China. SUMMARY: Currently, CTA is the imaging technique most frequently used to evaluate acute ischemic stroke, and patients with intracranial large-vessel occlusion usually undergo endovascular treatment. This single-center, prospective, cohort study showed that consecutive, multidose use of contrast during CTA and DSA does not increase the incidence of acute kidney injury in patients with acute ischemic stroke, though acute kidney injury tended to have a higher incidence in the contrast multiexposure group (P = .172). Apart from CTA/CTP, most patients with AIS, within the time window of recanalization, undergo intra-arterial thrombectomy, which is associated with exposure to additional iodinated contrast medium during DSA.4⇓⇓⇓–8 Because the potential risk from iodinated contrast exposure is proportional to the dose of contrast medium administered, multiple, consecutive doses of contrast medium could imply a greater risk for AKI.9,10 Although several studies have cited data regarding the safety of the consecutive use of contrast medium in patients with AIS for CTA/CTP and DSA, the sample sizes have been small, most of the studies were retrospective, and the definition of AKI differed among the studies.11⇓⇓–14 Hence, AKI induced by consecutive multidosing of contrast medium is still a perceived risk. We therefore performed this prospective study to determine whether consecutive, multidose use of contrast increases the incidence of AKI compared with its single use in patients with AIS. This study is a prospective, registered, cohort study performed from September 2016 to September 2017 at a single medical center with the approval of the institutional review board of the center. Informed consent was obtained from all patients or their legal representatives. Patient inclusion criteria were the following: 1) 18 years of age or older; 2) suspicion of AIS; 3) seen within 6 hours of developing anterior circulation symptoms or within 24 hours of posterior circulation symptoms; 4) no intracranial hemorrhage; and 5) underwent CTA. Exclusion criteria were lack of a baseline creatinine level or lack of a follow-up creatinine level 48 hours after CTA. All imaging was performed on a 64-section CT scanner (Optima CT660, GE Healthcare, Milwaukee, Wisconsin). For CTA, isotonic contrast material (1.5 mL/kg) (iodixanol, 320 mg I/mL, Visipaque 320; GE Healthcare, Piscataway, New Jersey) was injected at a rate of 4 mL/s, followed by a 20-mL saline bolus chaser using a dual-head injector. The upper limit volume of the contrast material was 100 mL. Intra-arterial treatment consisted of thrombolysis, mechanical thrombectomy with a stent retriever or aspiration catheter, balloon angioplasty and stent insertion, or carotid artery stent placement. The volume of the contrast (iodixanol, 320 mg I/mL, Visipaque 320) used during the procedure was recorded. AKI was defined as a >25% increase in the serum creatinine value over the baseline value 48 hours after CTA. The incidence of AKI was compared between patients given iodinated contrast medium for CTA (single exposure, CTA group) versus those given contrast medium for CTA and DSA (consecutive multiexposure, DSA group). The Student t test or the Mann-Whitney U test (for unevenly distributed categoric variables) was used to identify the difference in continuous variables. The difference in each of the categoric variables between the 2 groups was tested using a χ2 or Fisher exact test. Two-tailed P < .05 was considered statistically significant. 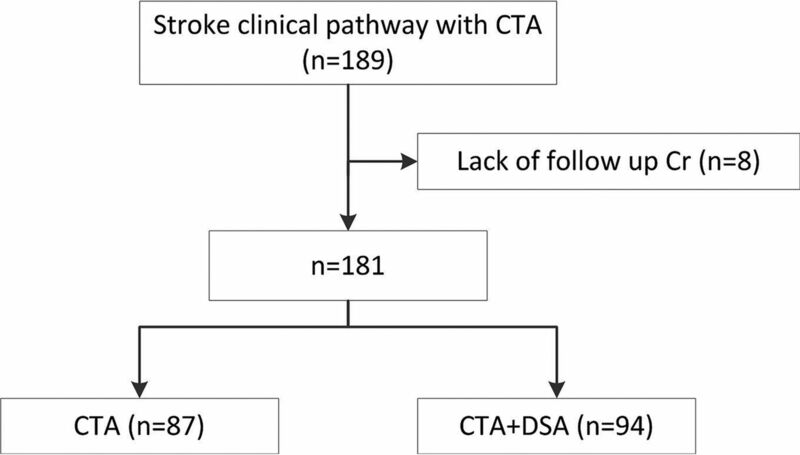 Altogether, 181 patients with AIS were included in this study (Figure and Table 1), of whom 87 underwent CTA examinations and 94 underwent both CTA and DSA examinations. All patients were given intravenous normal saline for hydration. The mean serum creatinine levels are shown in Table 2. Nine patients (5.0%) met the diagnostic criteria for AKI: 2 in the CTA group (2.3%) and 7 in the DSA group (7.4%) (P = .172). On average, patients with AKI had creatinine level increases: 0.24 ± 0.06 mg/dL (31.0% ± 6.9%) in the CTA group and 1.71 ± 2.42 mg/dL (131.6% ± 160.2%) in the DSA group. Although the study was designed prospectively, we did not expect that the postimaging laboratory studies would be unavailable for patients with mild symptoms who left the hospital early. Loss of patients presents a potential risk of biasing the results. In addition, the prevalence of underlying medical comorbidities, such as atrial fibrillation and heart failure, was higher in the DSA group, which may predispose the patients to develop AKI. There was no statistically significant difference in AKI incidence between the CTA and DSA groups, though a trend toward a higher incidence of AKI was observed with consecutive, multidose use of contrast (7.4% versus 2.3%). We agree that the benefits of the endovascular treatment most likely outweigh the potential risks of AKI because these benefits were confirmed in 5 prior trials.4⇓⇓⇓–8 We do think that controlling the total volume of contrast medium during the endovascular treatment is still necessary. This prospective study showed that consecutive, multidose use of contrast for CTA and DSA did not significantly increase the rate of AKI in patients with AIS compared with the 1-time use of contrast for CTA. The trend toward an increased AKI incidence after using more contrast should be further investigated. Zhen Yu Jia and Shao Xian Wang contributed equally to this work. This work was supported by the Construction Program of Jiangsu Provincial Clinical Research Center Support System (BL 2014084). Clinical Trial Registration: http://www.clinicaltrials.gov; NCT03132558. Accepted after revision November 18, 2018.